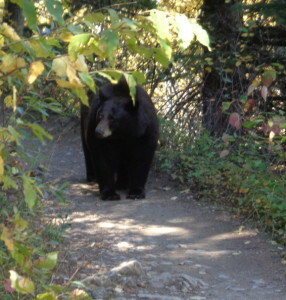 As I was hiking somewhere in the park to see a waterfall on my last day, suddenly, a short distance from me I see a black bear on the main trail ! Not in the trees or something, on the main trail. We stared at each other. I froze for a second, but was quick enough to… start taking photos! Want to read more? I visited the Smoky mountains with 2 friends. 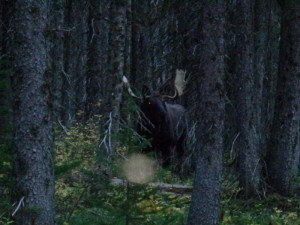 We woke up early in order to try and see some bears. One of them was really into it and the other wasn’t really… We entered the park and my job was to try and spot them bears. A few minutes passed and then I noticed something strange in the woods! 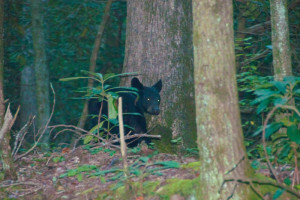 We parked the car and got out and there he was, not a full grown male, a rather young cub. My friend got a few good photos with his good camera and then the bear started to climb a tree… Which is, for itself, quite amazing! You wouldn’t expect such a big animal to be so agile. The recommendation for viewing wildlife is to wake up early. I woke up early and stood in the area where grizzlies rule the land but unfortunately didn’t see them. A bit later I saw a group of cars that stopped so I did too. First of all I saw many photographers setting their tripods and all, and then I saw the cute bear. But further down the road there was another one, much closer to the road! Want to read more? It was early morning and I took a short hike to some lake and several steps later I identified some shape in the woods… it was a big moose! That’s one big animal ! even though it’s not a carnivore you don’t want to mess with it… It immediately reminded me of the one I saw a year before, which now I understood was very young. During my visit to the Galapagos islands, I went for a short swim and suddenly the cute sea lion "joined me". It was so great !! These funny looking birds can be found in (some of the) Galapagos islands. The color of their feet almost seems unreal !